Really? We’re Now Deconstructing Donald Trump’s Neckties? The hardworking staff couldn’t help but notice that two major newspapers yesterday addressed the eccentric neckwear practices of the President of the United States. 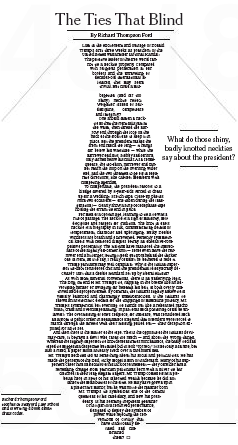 Exhibit A: Beth Teitell’s piece in the Boston Globe. Trump’s ties? Now that’s a long story. When it comes to a signature look, Donald Trump’s hair usually hogs the attention. But as his combover achieves “new normal” status, the public is now focusing on another curiosity: Trump’s remarkably long ties. When comedian Jon Stewart recently caricatured the new president on CBS’s “The Late Show with Stephen Colbert,” he did so wearing a red tie so long it dragged on the floor. “I thought this is how men dressed now,” Stewart quipped. And then there’s the tape. At 6-foot, 3-inches tall, Trump certainly isn’t a victim of a tie that is just too long for his torso. Rather, he intentionally ties it so it hangs long. The proof is in the Scotch tape. 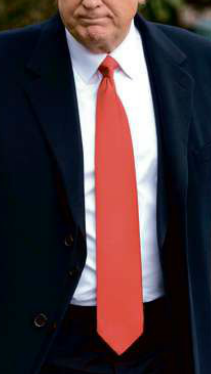 In December, when he was de-planing in Indianapolis to tour the Carrier plant, wind blew his red tie up to reveal that the billionaire uses tape to keep the back side in place. 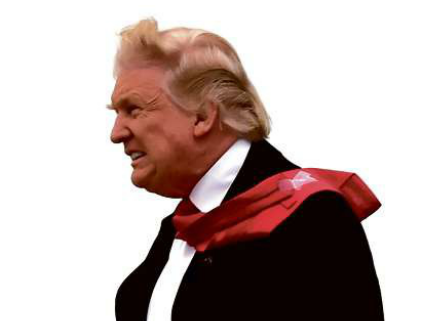 The DIY trick is needed, tailors say, because Trump makes the shorter part of the tie so short — to allow for the long front — that it doesn’t reach the inner, securing loop. Exhibit B: Motor 200 miles south, and you’ll find this smartly knotted Richard Thompson Ford op-ed in yesterday’s New York Times. Lost in the excitement and outrage of Donald Trump’s first three weeks as president of the United States was a minor sartorial scandal: The putative leader of the free world cannot tie a necktie properly. Compared with religious persecution at our borders and the unraveling of decades-old international alliances, this may seem trivial. But could a misbegotten (and far too shiny) necktie reflect weightier issues of self-discipline, competence and integrity? Hard to know what’s sadder here: Trump’s phallic coverage, or the news media’s Trump coverage. This entry was posted in Uncategorized and tagged Beth Teitell, Boston Globe, Donald J. Trump, neckwear, New York Times, Richard Thompson Ford. Bookmark the permalink.